Africa will be represented at next year's World Cup in Brazil by the same five teams that played in South Africa in 2010 and the hope is that their experience will pay off. The familiarity of the finalists has given Africa renewed optimism that one of its teams can advance further than the three quarter-final appearances the continent has managed since 1990. 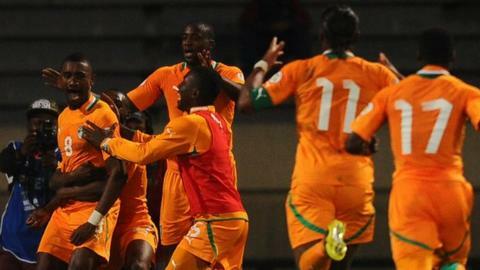 "We want to do something interesting in this World Cup, the previous two were difficult," Ivory Coast captain Didier Drogba said after his team beat Senegal 4-2 on aggregate in their play-off to qualify for a third successive finals. "In Brazil, we hope to have a few more chances and at least get past the first round," he told the Ivorian Football Federation's website. Placed 17th in Fifa's world list, the Ivorians are the top-ranked African side but are one in transition with the 35-year-old Drogba and many of his experienced colleagues nearing the end of their international careers. Looking beyond Ivory Coast, 23rd-ranked Ghana, effectively robbed of a semi-final place by a controversial Luis Suarez handball at the last World Cup, were the most impressive in regional preliminaries. They were devastating in hammering Egypt 6-1 in their play-off first leg last month and never in any danger of losing out on qualification in Tuesday's return in Cairo, despite going down 2-1. Nigeria established a new team and set their sights on peaking for the 2018 World Cup in Russia but hastily fast-tracked those plans when they emerged as surprised winners of the Africa Cup of Nations at the start of the year. Evidence of their potential was displayed on Monday when they drew 2-2 with Italy in London, some 48 hours after beating Ethiopia 2-0 for a 4-1 aggregate victory to secure a fifth World Cup qualification.